A Game Nobody Survives. This Year Might Be The Exception. The year is 2019. Television is now ruling people's lives. The most popular "audience participation" game show is "The Running Man" - where convicts can win pardons instead of "parting gifts" by defeating murderous henchmen known as "stalkers." The stalkers haven't had much of a challenge lately ... until Ben Richards (Schwarzenegger) comes along. Given his status as a movie icon, it seems somewhat surprising to realize that Arnold Schwarzenegger only starred in one movie that won its year’s box office race: 1991’s Terminator 2: Judgment Day. However, Arnie made his name on a slew of action flicks that didn’t dominate the multiplexes but that managed to turn a tidy profit. 1987’s The Running Man falls into this category neatly. Set in 2017, we learn about the collapse of civilized society into a fascist police state in which a small band of freedom fighters operates. 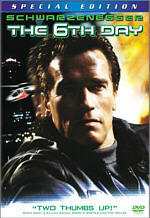 During a food riot, police helicopter pilot Ben Richards (Schwarzenegger) gets an order to fire on a food riot that includes unarmed civilians. He refuses to do so and goes to jail for his insubordination. The movie then jumps ahead 18 months to see Ben in prison. He plots with some other convicts to escape, and they succeed. Ben heads to his brother’s apartment but finds a new resident: Amber Sanchez (Maria Conchita Alonso). Everyone knows Ben as the “Butcher of Bakersfield” since the government doctored the footage of the food riot incident, and she tries to flee this alleged monster. However, Ben captures Amber and uses her to leave the city. Unfortunately for him, she rats him out at the airport, and the authorities capture Ben. A major TV show called “The Running Man” encounters stagnant ratings, so monomaniacal host Damon Killian (Richard Dawson) wants to spice up the proceedings. He sees video footage of Ben’s escape and thinks our man would be perfect for the show. On “The Running Man”, contestants try to evade bounty hunters to gain escape. Killian blackmails Ben to get him on the program. Going against his word, Killian uses Ben’s former co-prisoners Harold Weiss (Marvin J. McIntyre) and William Laughlin (Yaphet Kotto) as contestants as well. Before long, Amber learns that Ben isn’t the killer the government made him out to be, and she tries to help his cause. She gets caught, and this leads her to eventually become part of the game as well. The contest follows the contestants as they try to escape a grid while “stalkers” try to stop them. The latter group includes Professor Sub-Zero (Professor Toru Tanaka), Buzzsaw (Gus Wethwisch), Dynamo (Erland Van Lidth), Fireball (Jim Brown) and Captain Freedom (Jesse Ventura). The movie follows our protagonists attempts to survive, escape, and also find an uplink location from which the rebels can make the truth known. The Running Man stands as a strong example of a mediocre Eighties action flick. If you can think of a cliché of the era, you’ll probably find it here. The movie presents truly mindless action with excessive violence that tends toward the cheap side of things. Bloodshed in this era’s movies gets tossed out in a very casual manner and occurs with easy abandon, and we see much of that in Man. It also presents the broad comedy that typifies the era. No action can come without a punchline, and these gags usually involve aggression of some sort. To be sure, violence in movies has been around a long time, and it ain’t going anywhere anytime soon. Nor should it – violence is part of life. But never did movies toss out that sort of material with such cynical abandon as during the Eighties, and Man distinctly demonstrates those tacky excesses. Cynicism manifests itself in many ways during Man, most of which feel like cheap gags. We learn that the Department of Justice now has an “Entertainment Division” and Richards gets a court-appointed theatrical agent. The film tries to be incisive and witty but just seems dopey for the most part. Not that it didn’t have potential. Indeed, that’s what sets Man apart from other action flicks of the era. 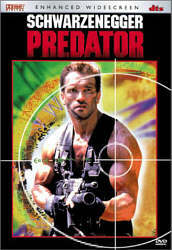 Like Predator, another Schwarzenegger actioneer from 1987, Man enjoyed a very cool concept. Also like Predator, unfortunately, it failed to live up to its potential. The idea of the life-or-death game show wasn’t tremendously original, but Man gave it a new spin. It simply didn’t manage to do anything creative in any other way beyond its source material. Director Paul Michael Glaser – best known as the dark-haired half of TV’s Starsky and Hutch - demonstrated very little skill behind the camera. He didn’t let Man fall apart and become a mess, but he also didn’t give it life and let it turn into anything notable. The movie’s lack of real personality becomes its greatest flaw. Man never truly bites, and it manages to manifest occasional fits of entertainment. However, it never seems remotely special. Mostly it comes across as loud and obnoxious without much else to it. Footnote: the film includes a comical end credits tagline. You may want to stick around through the flick’s conclusion to hear this. 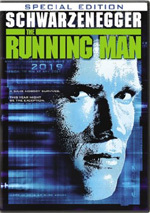 The Running Man appears in an aspect ratio of approximately 1.85:1 and in a fullscreen 1.33:1 version on these single-sided, double-layered DVDs; the widescreen image has been enhanced for 16X9 televisions. Only the latter has been viewed for this article. Although the movie looked a little drab at times due to the limitations of the source material, this seemed like a solid transfer. Sharpness consistently worked well. The movie appeared nicely distinctive and detailed from start to finish. I noticed no signs of softness at any point during the flick. No concerns with jagged edges or shimmering occurred, but some light enhancement seemed apparent at times. Print flaws stayed minor. The movie looked a little grainy on occasion, but not to a heavy degree. Otherwise, I saw a couple of specks and that was it; the movie mostly seemed very clean. Eighties film stock often left us with somewhat flat colors, and that issue affected Man in a slight way. At times the hues were a little dull, but they usually came across pretty well. Most of the tones seemed clean and vibrant, and I noticed no signs of bleeding, noise or other concerns, though shots with red lighting looked a wee bit rough. Blacks appeared a wee bit murky on occasion, but they also mostly were reasonably dense. Low-light shots came across as acceptably well-defined, though they seemed slightly thick on occasion. Man betrayed its late Eighties origins but mainly seemed like a satisfying image. Although those same source limitations kept the soundtracks of The Running Man from greatness, the mixes nonetheless appeared stronger than I expected. The widescreen version of the flick offered both Dolby Digital EX 5.1 and DTS ES 6.1 tracks. Both sounded virtually identical, as I noticed no differences between the pair. Both presented very active soundfields. Surprisingly, the audio spread the music prominently to the rear. The score still mainly came from the front, but the back speakers blasted a lot of useful music as well. Effects cropped up from appropriate locations all around the spectrum. Both ambience and more prominent elements showed up all around the situation. Of course, action sequences fared best, and those demonstrated a lot of life. Helicopters zoomed around the various speakers, and bullets flew effectively. When the show contestants flew through their tubes, the audio put us in the same circumstances. The surrounds acted as very active partners in the mix, and that included a fair amount of localized material in the rear; the remix took the original monaural stems and gave them new definition. Audio quality also seemed pretty good, but that was where the restrictions of the era caused some concerns. Mostly the effects suffered from age to a moderate degree. They seemed acceptably accurate but tended to be a little harsh at times. The effects did demonstrate pretty nice bass response, but they also showed some light roughness and distortion, and they occasionally came across as a bit dinky; gunshots especially lacked much heft. Music, on the other hand, was quite dynamic and engaging. The score was rich and vibrant. Speech seemed acceptably natural and crisp, and I noticed no issues connected to edginess or intelligibility. Overall, the audio of The Running Man seemed very solid, and it fell sort of “A”-level territory just because of some source concerns. One caution about the audio: make sure you start your volume knob on the low end. Both the Dolby Digital and DTS tracks seemed much louder than usual, so begin with that knob at the left and proceed cautiously! Previously released as a movie-only edition, this new version of The Running Man packs a mix of supplements. (The anamorphic transfer and the Dolby Digital and DTS tracks are also new to this version; since I didn’t see that one, I can’t compare the two releases.) On DVD One, we get two separate audio commentaries. The first comes from director Paul Michael Glaser and producer Tim Zinnemann, both of whom sit together for this running, screen-specific piece. The commentary presents a modicum of decent information but mostly seems lackluster. The pair cover a mix of issues related to the film. We learn about how Glaser came onto the project at a late date and why the producers dumped prior director Andy Davis. We also hear about set and visual design, some casting elements, stunts, and changes made to the original book, among other topics. A lot of the time, the pair get into some semi-intellectual discussion of the current state of reality TV, news, and other media-connected subjects. That kind of material can be involving and compelling, but here it doesn’t work. It just comes across as banal and somewhat pretentious, and the commentary doesn’t manage to become anything terribly rich or intriguing. In addition, the track suffers from many stops and starts. Many gaps appear, and while none of these last too long, they pop up frequently enough to make the pacing uneven. I can’t call this a bad commentary, but it seems generally flat and mediocre. For the second commentary, we hear from executive producer Rob Cohen, who offers his own running, screen-specific piece. Actually, to refer to this as “screen-specific” is a stretch, for Cohen doesn’t say much – if anything – that directly addresses the film’s on-screen action. Instead, he gets into how he acquired the property, adapting it for Schwarzenegger, financial structuring, other possibilities for the lead, the original director and why he didn’t work out, other directorial possibilities, specifics about the problems with Davis, why Cohen eventually got dumped from the flick, and a number of other facets of the production. As with Glaser and Zinnemann, Cohen indulges in some musings about the nature of reality TV and those issues plus a variety of political issues and thoughts about Schwarzenegger. Overall, Cohen’s track seems much more interesting than the prior one, though it comes with its own faults. It starts very well and is very compelling up until the point when Glaser comes on the flick and Cohen ultimately gets the boot. Once all the players are in place, Cohen doesn’t have as much to say, though his discussion of TV topics seems better than the one in the prior track. 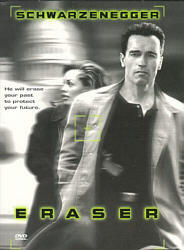 Cohen makes at least one glaring error, however, when he states that he and Schwarzenegger were anxious to work with Davis due to the director’s production of Under Siege. Since Under Siege didn’t come out until five years after the release of Running Man, this is obviously way off base. Nonetheless, even with this mistake, Cohen offers a pretty informative and interesting chat. Also on DVD One we find Lockdown on Main Street. This 24-minute and 36-second program examines “civil liberties post 9/11” via news footage and interviews. We hear from USC Professor of Law and Political Science Erwin Chermerinsky, National Lawyers Guild executive director James Lafferty, Center for Constitutional Rights senior litigation attorney Nancy Chang, ACLU associate legal director Ann Beeson, and Electronic Frontier Foundation senior staff attorney Lee Tien. They discuss prior abuses of rights and the current climate, with a particular emphasis on the potential issues involved with the Patriot Act. The piece offers a disconcerting look at how the government takes away rights in times of crisis and steps beyond appropriate boundaries, but “Lockdown” lacks any form of balance. It relies totally on groups opposed to laws like the Patriot Act and fails to temper this with opinions from the other side. While informative and provocative, that absence of an alternate viewpoint makes its usefulness more limited. When we head to DVD we find another documentary called The Game Theory. In this 20-minute and 14-second piece, director Glaser, New York University Professor of Cinema Studies Toby Miller, Game Show Network Senior Vice President of Programming Bob Boden, Series 7 director Daniel Minahan, Fear Factor executive producer Matt Kunitz, former Survivor contestant Sarah Mariah Jones, College of Staten Island, CUNY Professor of Media Theory and Cultural Studies Edward Miller We hear a little about the history of reality shows and various issues connected to these series such as why they appeal to people, the different kinds, and where these programs may go in the future. It’s a decent examination of the subject but it doesn’t provide a lot of insight. In addition to the movie’s trailer, we get Meet the Stalkers. This interactive feature gives us details about the dudes who try to stop the Running Men. We find pages for Captain Freedom, Dynamo, Sub-Zero, Killian, Buzzsaw and Fireball. These include character film clips and statistics, trivia about the personalities, and close-up looks at costumes and weapons. It’s all fairly tongue-in-cheek and only moderately interesting. The package finishes with an eight-page booklet. This piece mostly presents some decent notes from director Glaser. Otherwise it rounds out with chapter stops and a list of special features. A very broad mix of comedy and action, The Running Man fails to succeed mainly due to a severe lack of personality. From its generic characters to its bland action sequences, the movie enjoys a clever premise but it suffers from flat and listless execution. The DVD seems good, however, as it presents pretty accurate picture plus surprisingly active and involving audio. The extras vary in quality but provide a reasonably interesting set of materials. I can’t recommend this one to folks new to the flick, but fans of The Running Man should feel pleased with this new edition; it seems like a good upgrade from the older disc.